FFE Magazine > Entertainment > Sports > Will it be a K.O. for either Manny Pacquiao or Juan Manuel Marquez? Will it be a K.O. for either Manny Pacquiao or Juan Manuel Marquez? Boxing fans from all over the world will be on their feet once again as champions Manny Pacquiao and Juan Manuel Marquez meet in the ring for the fourth time. 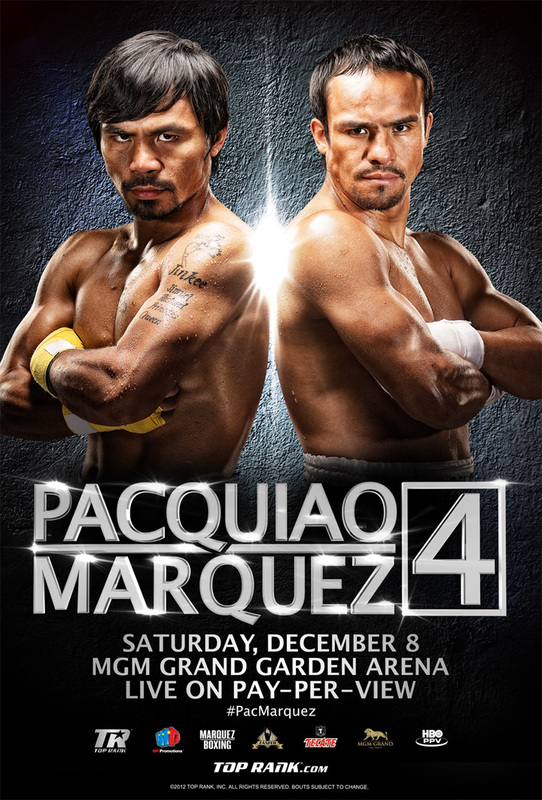 This coming Saturday, December 8, at the MGM Grand in Las Vegas the Philippine fist Manny Pacquiao will fight in a rematch against Mexican champ Juan Manuel Marquez. Many are excited, as the last three fights between the two boxers have been controversial. To refresh everyone’s memory, the last three matches have resulted in a draw, a split decision to Pacquiao and a majority decision to Pacquiao. This time around however, Pacquiao and Marquez have publicly stated that they are both gearing for a knock out to assure a clear victory, without the outcome coming from the judges’ table. In a recent interview, Manny Pacquiao has already stated that he did not want the people watching this fight to be just satisfied. He has repeated that he does not care about the belt or the money, only the win. Similarly, Juan Manuel Marquez has also stated that he has won all of the last three fights, and would like the referee to raise his hand once again – that he has take it out of the judges' hands this time. Most fans and media have favoured Pacquiao in the last decade, but lately the majority are predicting for a Marquez win. Commentaries suggest that Pacquiao has remained stagnant, if not slowing down, over the last several years as he recently came off a majority decision loss to Timothy Bradley in June. Meanwhile, ­ everyone is noticing Marquez’s change in appearance and attitude since coming from a unanimous decision victory against Serhiy Fedchenko last April. Marquez’s fiery disposition appears to be hungrier and more focused than team Manny who, according to US-based Anthony Andales, a reliable roving boxing correspondent, does not have the heart for boxing anymore. Other experts suggest otherwise or another possible draw. For both boxers, it is certain that the outcome rests with a K.O. from each of their bruised hands. Both want and will claim the victory as this battle was arranged for so much more than a belt or a prize. Whatever the result, a sure spectacle in the world of boxing will be made on December 8. But no matter what happens, we will be rooting for our very own pound-for-pound hero!